When designing several multipurpose rooms and adjusting the size of these rooms according to the needs and demands, it is best to design more separate temporary rooms. But this kind of designing is impossible with walls that cannot be moved; as the surface and the dimensions of the room are not adjustable thus also the shape and look always remain the same. It is impossible to adjust them to every current need that may appear. However this is all possible with movable partition walls that are a bit more expensive but the investment will soon pay off all by itself thanks to the possibilities they offer. These walls offer endless possibilities and advantages. 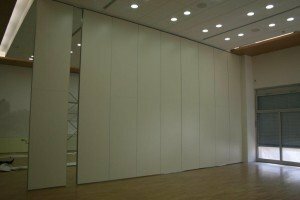 Movable partition walls LS100 enable their owners to create temporary rooms according to their wishes, to adjust them to every demand, to transform an empty space into a conference hall, a room for a banquet, a lecture or anything else. All these rooms can have their dimensions adjusted; they can form a square or a rectangle with adjustable point of entrance, the desired appearance etc. Even rounded rooms are possible to attain with these walls. It will be simple to remove and store separate elements of movable partition walls, that you do not need at the time. As far as the soundproofing and expected solidity are concerned, movable partition walls are completely equivalent to the fixed walls. All rooms can be taken at once, but the people inside the room will not be aware of the people in adjacent rooms. With these walls your rooms will be just right and appropriate for almost every demand of your clients. And satisfied customers are an important advantage that will separate you from your rivals.